Thursday was good. The principal of our afternoon show was a fantastic woman from Atlanta, Georgia (when she said it it had more syllables than I can imitate. I love how Georgians pronounce Georgia.) who was excited to have us. She wanted to know our whole life story and was happy to hear all about our lives. In our second show at the school though, a kid got up and left during our show and didn’t return. He was angry because he couldn’t see, I think, and two teachers chased after him into the hall. I’m sure he was fine, but it reminded me too much of other events that may or may not haunt me. I couldn’t get her out of my head that night and I wonder if I ever will. I wish I would have woken up that morning and sat with her. The kids enjoyed the program immensely however, and it was a joy to bring theatre to children who do not get to enjoy it on a regular basis. 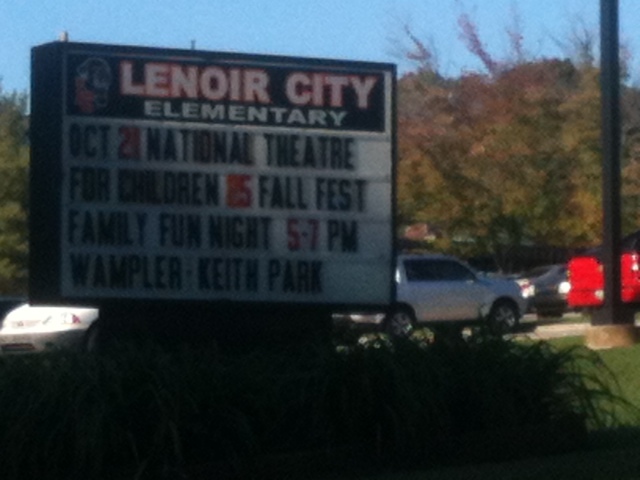 We pulled up to our school to find that we were on the marquee! Our morning school had a fantastic principal who greeted me with a smile and a hearty handshake. His name was Skip, and I could tell he loved his job so much. A woman named Mary coordinated our visit, offering us refreshments and a pitcher of filtered water that was delicious. Two teachers, a PE teacher and an Art teacher, also made us feel welcome by offering their services and being very friendly. The children were fantastic to work with as well, and we were sad when we had to leave. Our afternoon show was great too, but after the second one I started to feel my throat tighten up. Uh-oh. By the time we got to the car, it was difficult to speak and impossible to swallow. We checked into our hotel and I immediately climbed into bed, happy that it was the weekend and I had time to recover. I slept from 5 pm til about 10, then went back to sleep after chugging some water. When I woke up at 6 am, my throat was feeling a bit better and it wasn’t as impossible to swallow. I watched the sunrise and made my way to the breakfast room to drink all the orange juice I could get my hands on. I’m able to speak again, but my throat still feels pretty dry and I’m on strict vocal rest so I can kick it in the bum. Andy and I have two tickets to horse riding stables at 3 pm. You can bet I won’t be missing that. The last time I was on a horse was 11 years ago. Too long, if you ask me. High-ho Silver, away!